NOTE: Eventhough the Power Supply Transformer is NOT shown in the above Photo, it is included with the BIOMAGNESONIC TRANSDUCER II™ (see below). There are NOW 2 - Banana Plugs (red & black) on the Input Cable, instead of the BNC Plug. DISCLAIMER: The BIOMAGNESONIC TRANSDUCER II™ is to be used "FOR EXPERIMENTAL PURPOSES ONLY". The BIOMAGNESONIC TRANSDUCER II™, being pulsed by a SPECIFIC Sine Wave Frequency, is to be used to radiate Biomagnetic and Pulsed Electromagnetic Fields, plus Sound and Pressure Waves onto a SPECIFIC Body Area (i.e. - Joints, Involved Muscles, Tumors, etc.). 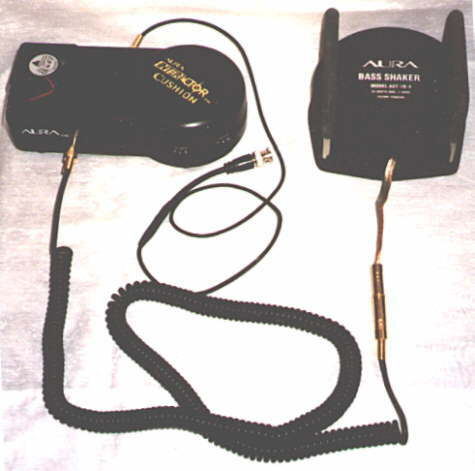 The BIOMAGNESONIC TRANSDUCER II™ is a POWERFUL Healing Tool, which is to be connected to the WAVESHAPER™ Frequency Instrument or another Function/Frequency Generator (or even a CD Player + Sound/Music Therapy CDs), so that Biomagnetic (North Pole/Negative -) & Pulsed Electro-Magnetic Fields, plus Sound & Pressure Waves can be generated at a SPECIFIC Infratonic (VERY LOW) Frequency (see Frequency Chart 1 or Frequency Chart 2) and radiated into SPECIFIC Areas of the Body for SPECIFIC Health Conditions. These SPECIFIC Frequencies have been found by Health Researchers and Practitioners to have PAIN RELIEVING &/or HEALTH STIMULATING Effects on the Body and are used on SPECIFIC Acupuncture/Trigger Points &/or PROBLEM Areas of the Body. NOTE: Please see Frequency Chart or Frequency Chart 2 for other Health Effects. Sound & Pressure Waves 5 3/8" D., 3 1/2 lbs. 1. Infratonic Amplifier (1 - VERY LOW Frequency 10 watt Amplifier, 1 - 12 Volt A.C. Transformer & Cable w/3-pin DIN Plug). 2. Infratonic Transducer (1 - VERY LOW Frequency Sound Transducer & 2 - Rubber Cushioned Metal Handles. 3. Output Cable (1 - 5" Dual Conductor Wire, 2 - Gold 1/8" Plugs, 1 - Gold 1/8" Jack & 1 - 25' Coiled Cable ). 4. Input Cable (1 - BNC Plug, 1 - 4" Coaxial Cable, 1 - 28" Dual-Conductor Coaxial Cable & 1 - Gold 3-cond. 1/8" Plug ). arrangements made to pay for copy costs. If you're using the BIOMAGNESONIC TRANSDUCER II™ with a Frequency Generator other than the WAVESHAPER™ Frequency Instrument, then please call me (Tom - 614-237-2590) and let me know, if the OUTPUT Connector is other than 2 - Banana Jacks and the Output Impedance is other than 300 Ohms. Purchasing The BIOMAGNESONIC TRANSDUCER II™, Then Please CLICK HERE. Ordering The BIOMAGNESONIC TRANSDUCER II™, Then Please CLICK HERE. Reading The Explanation About The BIOMAGNESONIC TRANSDUCER II™, Then Please CLICK HERE. Seeing MORE Information On Infratonic Sound Therapy, Then Please CLICK HERE & HERE. Seeing MORE Information On Sound Therapy, Then Please CLICK HERE. Seeing MORE Information On Biomagnetic Therapy, Then Please CLICK HERE. Seeing MORE Information On Electromagnetic Therapy, Then Please CLICK HERE.